Capsulitis is a common cause of pain to the ball of the foot known as the forefoot. The term capsulitis refers to inflammation of the joint capsule in the forefoot region most often involving the metatatarsalphalangeal joint to the second toe as shown in figure 1. The joint capsule anatomically is a fibrous tissue that surrounds the joint and holds the synovial fluid that lubricates the joints. The cause of capsulitis is generally related to abnormal stresses placed on the joint capsular tissues in the forefoot region. Weight bearing forces occurring during walking are usually shared between the heel bone at heel contact and the forefoot including the first through fifth metatarsal with forefoot loading. The arch region receives relatively little pressure in comparison as depicted in figure 2. The forefoot composed of five metatarsal bones have separate contact points including the first through the fifth metatarsal bone. The second metatarsal bone, due to its relatively stable position within the middle of the foot, as well as its relatively increased length compared to theother metatarsal bones, puts it at risk for injury. Figure 2 shows specific weight bearing of the foot with the red showing areas of increased pressure. Increase pressure on the bottom of the second metatarsal can cause this injury with inflammation and pain noted secondary to an unequal distribution of pressure being placed on the metatarsal. Symptoms include pain with initial weight bearing in the region of the second metatarsal bone on the bottom of the foot with increase pain noted with daily walking activity. Pain is typically sharp in nature with occasional radiation to the toes. Swelling is commonly seen at the base of the second toe when the capsulitis involves the second metatarsalphalangeal joint. Clinical symptoms include pain localized to examination at the base of the involved toe. 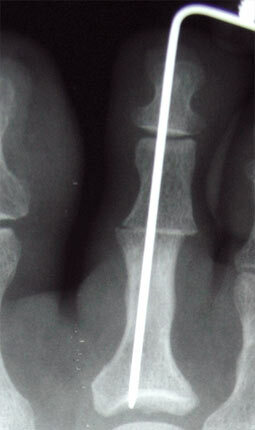 Pain is generally noted on the top and bottom of the toe and is also noted with range of motion of the digit. Capsulitis can indicate a more serious underlying problem called a plantar plate injury. The plantar plate is a dense fibrous tissue on the bottom portion of the joint capsule. A tear in the plantar plate can lead to instability of the joint which can lead to the development of a hammertoe. Instability that occurs with a plantar plate tear can often be clinically determined by using a modified “lachman test”. The “lachman test” is an exam where the toe is stressed with the amount of motion on the involved toe compared to that of the assymptomatic foot. The plantar plate injury is not well visualized with MRI studies but can be determined with greater accuracy by the use of dye diagnostically injected into the joint. 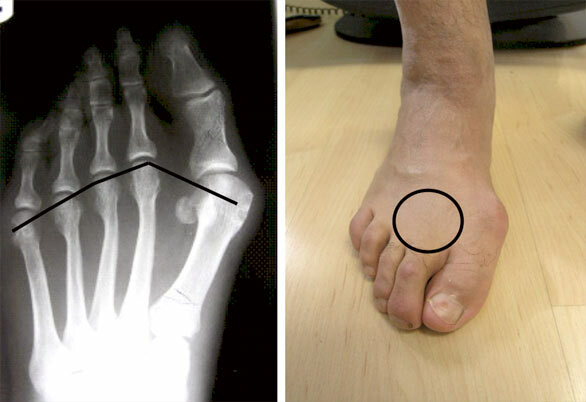 The plantar plate injuries often lead, when untreated, to a hammertoe deformity which is a flexion contracture of the affected toe as seen in photo 2. Treatment for capsulitis focus’s on decreasing the inflammation of the tissues as well as decreasing the pressure on the affected joint. Anti inflammatory measures include the use of ice, non steroidal antinflammatories including ibuprofen or naproxen as well as cortisone injected into the joint. Cortisone is probably the best measure to decrease the inflammation of the joint. The relief of pain can be long lasting after the single use of cortisone. Shoes and orthotics have a critical role in helping to resolve symptoms associated with capsulitis. Specific features that are important include a shoe with adequate cushioning in the forefoot region, adequate width to decrease the compressive forces on the metatarsal bones and a shoe with enough room to accommodate an orthotic. The over the counter orthotic as seen in photo 3 decreases pressure on the affected metatarsal by translating more pressure through the arch. Custom fabricated orthotics may be needed to appropriately reduce the pressure through the ball of the foot. Shoes and orthotics must be compliantly used for all walking activity during therapy. Limited periods of barefoot walking while at home can delay healing of the injured tissues. Specific shoe and orthotic use should be viewed by the patient as a short term measure until complete healing has occurred. Many patients after recovery can resume the use of their normal shoe wear. Chronic pain and swelling to the region can lead to the development of a hammertoe deformity as seen in Picture 4. A hammertoe deformity is a complex deformity of the affected toe with a flexion position of the middle of the toe and an extended position of the metatarsalphalangeal joint. Symptoms related to a hammertoe deformity are often related to the development of painful callous on the top or the end of the toe. Wearing a shoe that has enough depth to decrease abnormal rubbing on the top of the toe is important in conservative treatment . If conservative therapy does not relieve the pain associated with a hammertoe deformity that develops as a result of chronic capsulitis that is resultant from a plantar plate tear surgery may be required. Surgical care of a hammertoe includes straightening the second toe by removing cartilage at the proximal interphalangeal joint and stabilizing the toe until bony healing has occurred. This hammertoe repair with joint fusion termed arthrodesis will allow the toe to remain stable on the ground during stance. For a true plantar plate injury the surgical care may include soft tissue releases, arthrodesis and tendon transfer to the affected toe. Successful conservative care of capsulitis is dependant upon appropriate pressure reduction with the use of shoes and orthotics and appropriate use of anti inflammatory therapies. Surgical options are pursued at a point when conservative therapy has failed to relieve pain. Surgical outcomes create stability around an unstable joint and does provide long lasting relief. A brief video on Capsulitis in the forefoot.